Phalaenopsis orchids enjoy a fairly warm climate. The ideal night temperature is 62 to 65 degrees F. and daytime temperature range of 70 to 80 degrees. Since this temperature range is similar to that of many homes, it makes an ideal house plant. Phalaenopsis orchids do not require too much light to grow well. 1000-1500 foot-candles is the ideal light intensity required for Phalaenopsis. If grown in a windowsill, an east exposure proves to be the best. One must take care, though, not to burn the plant by allowing too much sunlight to shine directly on the plant. It is best to provide some shade, such as a sheer curtain, allowing perhaps a little more light to hit the plants from the beginning of December through the middle of February. Water your Phalaenopsis orchids early in the morning. This insures complete water evaporation on the foliage as well as the crown by nightfall. Water with rain, distilled, or reverse-osmosis water as the mix approaches dryness. Never use water that has been softened by a water softener. Generally Phalaenopsis require watering about once every 4 to 7 days. Plants should never stand in water! Plants that stand in water or that are watered in the evening will develop bacterial or fungal rot. Pull out the plant label and see if there is any water residue on it. If not, it is time for watering. The weight of the pot can also help determine whether it needs watering or not. The pot should be fairly heavy after watering. We highly recommend Green Jungle Orchid Food, especially formulated to work with rain, distilled, reverse osmosis water or water low in alkalinity. If the plant is potted in bark, fertilize with Green Jungle every time you water, all year round, then flush with clear water once a month. If potted in sphagnum moss, use Green Jungle every third watering. This is the fertilizer that we developed and use on our own plants. The results have been excellent. For tap or well water, use Grow More 20-10-20 fertilizer every other watering in the summer and every third watering in the winter. Fertilize at the rate of one-half teaspoon per gallon. Phalaenopsis orchids are of a monopodial growth without any pseudobulbs to help store moisture. For this reason, it is important to provide good humidity. 50-70% is considered ideal. However, if the plant is kept wellwatered, it will adapt to a lower humidity. Commonly referred to as the "moth orchid," Phalaenopsis are one of the longest blooming orchid genera, producing flowers that last from 2 to 6 months before dropping. 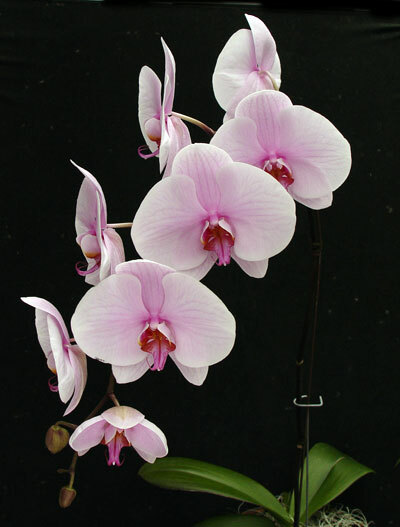 Phalaenopsis have also been known to bloom 2 to 3 times per year once they have reached a mature size. After it has flowered the first time, cut the stem just above the node where the first flower bloomed. From the top node a new flower stem should emerge within 2 months. If there is no response or the flower spike turns brown, cut it off near the base of the plant where it emerged. Because the Phalaenopsis is watered frequently, the potting breaks down about once per year. Spring or fall is considered the best time to repot because the temperature is generally mild, preventing shock. Use a medium grade orchid bark mix for plants in 5" and larger pots. We have found that New Zealand sphagnum moss works best for smaller Phalaenopsis as it dries out more evenly. There are many factors that can cause buds to dry up and drop off the plants without ever opening. Check the following: Is the room too hot? Is the light level too low? Is the plant too dry or too wet (causing root rot - this is the most common cause)? Are you using softened water instead of clean water? Are you using too much fertilizer? Are the plants being subjected to a cool draft? Is the plant near strong fumes such as new carpets, refinishing woodwork, etc.? Bud blasting is a common problem with Phalaenopsis. Fortunately, there is almost always a reason that can be determined.